Are you incorporating magic into your creative practice? Today’s guest, Yumi Sakugawa, is a comic book artist inspired by the universe and her own experiences as an Asian American woman. 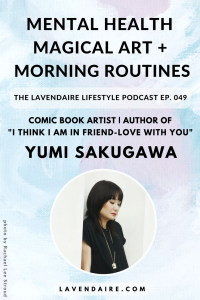 In this episode, Aileen and Yumi delve deep into creativity and darkness, how art pushes us towards an ideal future, and mindful morning routines.